We do a family themed costume every year and since we've really been into the Hamilton soundtrack we decided to dress up as characters from the musical. 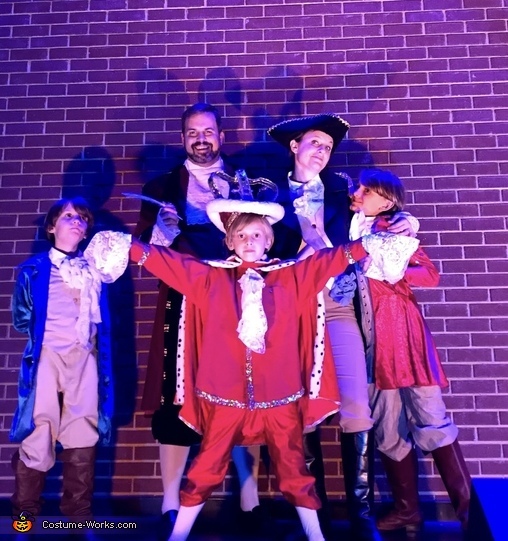 Dave (Dad) is Thomas Jefferson, Kara (Mom) is George Washington, Noah (oldest son) is Aaron Burr, Reagan (middle son) is Alexander Hamilton, and Alex (youngest son) is King George III. We collected jackets, vests and hats from thrift stores throughout Texas and for the George Washington costume I hot glued curtain tassels, ribbon, and buttons on the shoulders. For King George III I hot glued gold accessories throughout and made the crown from foam paper, wire hanger, ribbon and jewels! Most of the ascots and sleeve accessories I made from an old lace curtain.